Discovering the underground food court at the University Village on UBC campus was sort of like finding an unexpected twenty dollar bill in the pocket of a jacket that you haven’t worn since the season last dictated it was appropriate. It was very much a dungeon-like cavern hidden from the main floor road that I’ve passed by many times. Stepping inside the doors, I was surprised to find such a busy place during what is essentially off-season for classes, and the myriad of ethnic food options available. Granted, its very much food court in setup and appearance, with various tenants operating kitchens and table seating to accommodate people to eat right on the spot. Walking and scanning the scene, there were some Shawarma/Middle Eastern offerings, the requisite pick-your-items Chinese, a sushi shop, Mongolian BBQ, Indian, Korean and Malaysian. It was this last booth called Maple Malaysian Cuisine that led me here on this day in the first place, as I’d spotted a big banner for it outside from the road, and it raised my curiosity and my eventual discovery of this entire floor. I know there are plenty well respected and more dine-in appropriate choices for Malaysian cuisine in the city, but finding a cafeteria scenario for a quick take out was a pleasant surprise. The menu board on the back wall next to the booth itself, featured an array of dishes (noodles, rice, fruit-based, and combo platters) each with a photograph and text description underneath. Prices appeared to range from about $5.99 (Mee Goreng, Curry Laksa, etc.) 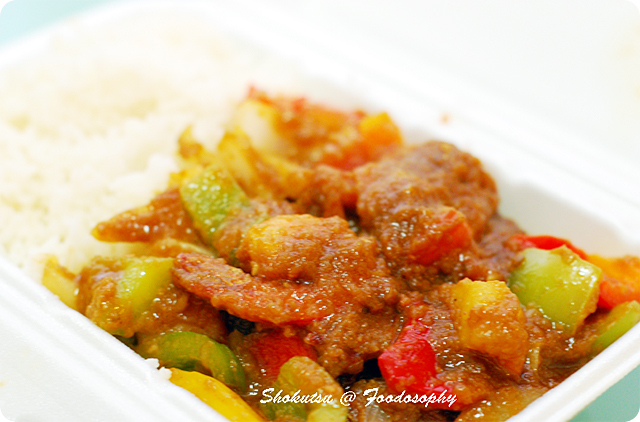 to $9.99 (for the chef’s speciality: black pepper king prawns served with rice). As well, there were several appetizer, dessert and drinks available. Though I’ve been to Malaysia a few times and enjoy the cuisine, I know I am probably stuck in a rut and tend to order the usual suspects. I thought since the lineup was just me, that I’d chat up the man working inside and ask what he’d recommend, what’s popular, etc. He pointed me to the fruit-based dishes section and after a quick chat, I went with one of his recommendations, the Mango Seafood Rice. Gawd, I miss the fresh mangos in Southeast Asia! As a second item, selected the Sambal Prawns. While waiting he offered me a sample of one of the desserts, he called it the Glutinous Rice Dessert, and reminded me of a similar dish (Japanese Adzuki Beans) though not as sweet. A man seated nearby was digging into what appeared to be some kind of seafood medley wrapped up in banana leaf and served with veggies and coconut rice. I received my order number tag, and wandered about the floor looking into each kitchen to see up close what else could be had, knowing that I will probably come back for the cheap offerings here and try things out. The Mongolian place was the most interesting setup, with a mix of meats and veggies laid out, I think you are to select the items you want and its all cooked up for you on the spot somehow. Nobody was ordering at the time, so could not see how this was actually done, but did grab my attention. About a 10~15 minute wait, and my meal was ready to go. The fellow was quite nice in explaining what was in each container so I wouldn’t be confused. I asked how long he’d been in this location, a year he said, furthering my shock at not knowing about this place until this day. As I’ve exhausted the nearby takeout options in this block, I am quite certain I would be back, as I headed back to my car, wonderfully smelling back in tow. 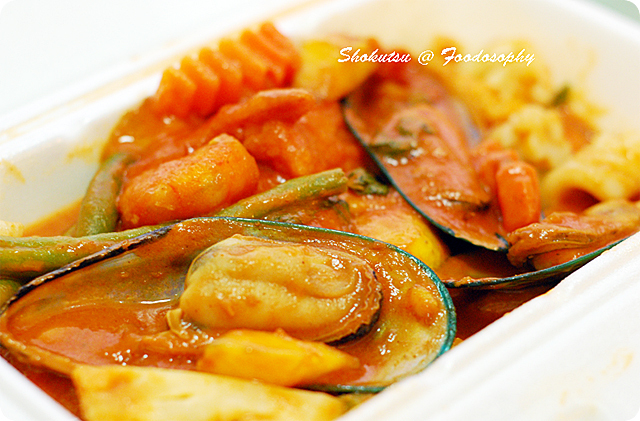 The Mango Seafood Rice contained mussels, prawns, fish, squid, carrots, broccoli, mangos, green beans – all coated evenly in a somewhat watery and sweet mango sauce. I can’t fully describe the flavors in the sauce as I’m not very familiar with Malaysian ingredients, but it was somewhat tomatoe-y in nature and in color, though the mango base made the thing overall sweet, but not overpoweringly so, and went just fine with the white rice. The Sambal Prawns I think I preferred among the two items I brought back. It had a nice kick of heat, and deeper seafood flavors in the sauce that was not as liquid-y as the previous dish, and each ingredient (prawns of course, green and red peppers, onions) was again nicely coated. It would have gone well with a nice cold beer, but alas my fridge was devoid of such. (Foodosopher, I know what you will say, rookie mistake). For the pair of choices, it came to about $15 and plenty enough for a meal-for-two. A nice, simple ethnic takeout option compared to the nearby burger joints in the same block, that was welcome on this night. Certainly at this price point and setting, you’re not getting the most amazing Malaysian meals that you could, but I’ll be back to sample more from this kitchen for sure, and from the others as well no doubt, when I am lazy and don’t feel like cooking myself. I hope some of you readers discover similar enjoyable finds in your neighborhoods that you may have overlooked for the longest time. So it looks like I may be taking a trip to Vietnam this winter. Not sure if this is influencing my eating experiences of late, but with two bowls of pho consumed over the past four days, I am beginning to wonder if its somehow subliminal. My latest outing was at Pho 99 Vietnamese Noodle House, which I spotted randomly while driving by looking for an quick and early lunch, and it was one of the few restaurants that had an open sign up in the area at about 11am (my other bowl this was at the Pho Hoang Vietnamese Restaurant on Main Street, Vancouver). There was also a sandwich board out front that had text in English, Chinese and Korean, which threw me off before I entered and heard the unique sounding chatter in Vietmanese among the staff. Luckily, I caught the place just as it was opening. There’s a free parking lot in the back of the building that is connected to other businesses, as there is no parking allowed on the front street. Incidentally, Pho 99 is located right across the street from Zen Fine Chinese Cuisine, the place that has received a lot of press this year both from a New York Times reporter and the Vancouver media. Stepping inside, I was pleasantly surprised to see that things looked pretty new, and most of all clean. I think either the owners just took over a previous tenant and did some superficial updates or the place has only recently opened for business. It was brightly lit and the partially white colored walls contributed to it feeling a lot more refreshing than your usual hole-in-the-wall joint that serve pho. Maybe the weird plastic tree near the booth I was in, wrapped with some more plastic tubing containing some lights, added to the overall glow too. LAUGH! 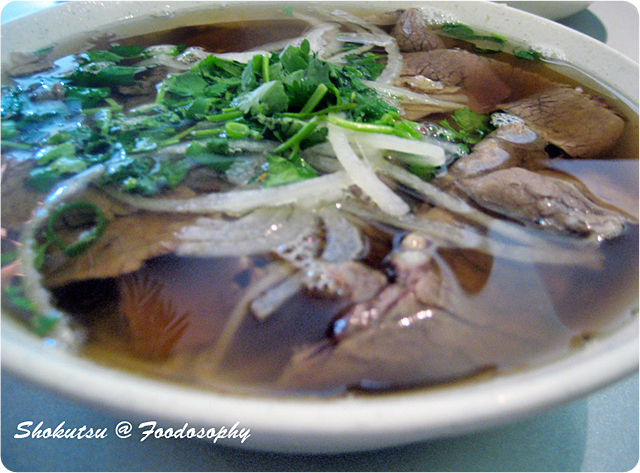 As I mentioned in a previous pho posting, I like my broths light when I eat this dish in the A.M. Pho 99 did this and was even less salty than other places I’ve visited, which was nice and made it feel even healthier. I know, most people will say that pho is pho, not much difference from this place to that, and I’ll agree, given that its pretty standard fare in many Asian countries, soup noodles that is, and practically their cultural replacement for ‘fast food’. Keeping with the lighter fare, I chose the well done flank and brisket toppings. Again, I know other will vouch for the more fattier, interesting meat choices here, and Pho 99 offers them all, even dividing their menu sections by “For the Beginner”, “Just The Regular” and “For Adventurer’s”, each with more unorthodox cuts and parts of meat. The non-pho side of the menu offered selections of specialty items, side orders, rice plates, appetizers, egg noodle soups, and Vermicelli bowls. The entire menu sheet is laminated and double-sided, with the back listing out various drinks, including Vietnamese coffee that our server asked if we were interested in but we stuck with the complimentary tea. My lunch companion’s seafood noodles. 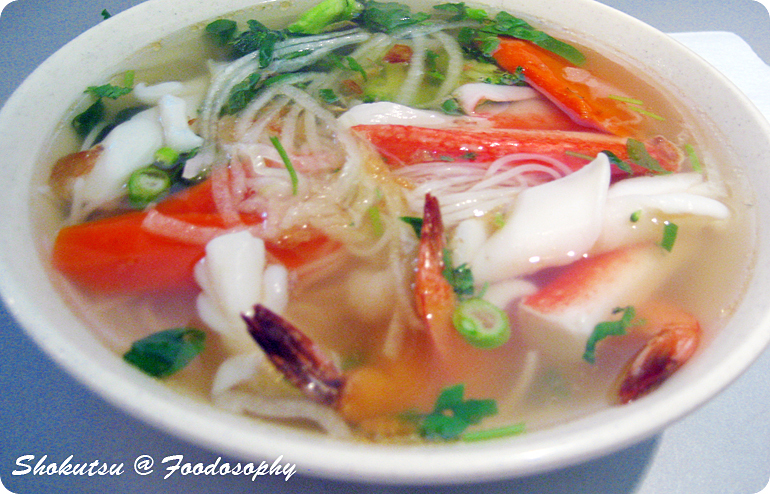 An even lighter non-beef broth, though the use of frozen seafood ingredients was clear. Also, broccoli and carrots in the mix. Baja Fresh. Freebirds. Chipotle. These are not Mexican by any stretch of the imagination, but can be classified as “Fresh Mex“, “Mexican Grill”or any other variety of classifications. What they serve, is a fresh, healthier alternative to the classic Mexican burrito. No lard. Fresh vegetables. That sort of thing. What they lack in authenticity, they make up for in quantity, and price. They serve a lot of food, at a good price point. 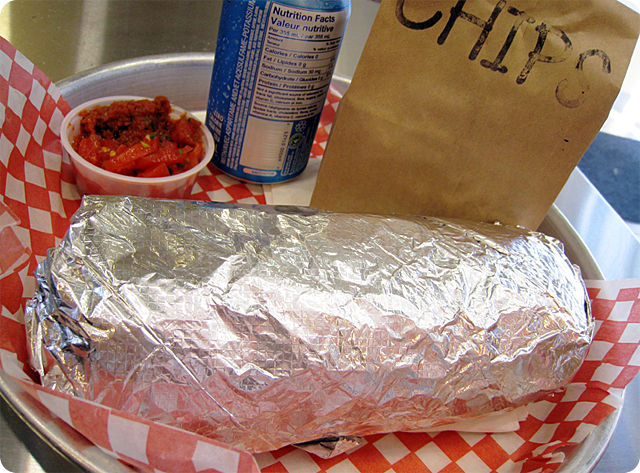 A large burrito usually comes in the size of your forearm. And then some. I’ll admit, while this stuff isn’t gourmet, everybody has their favorite – and it is pretty tasty. And while healthier usually equates to “not as tasty”, this is one instance where I can honestly say “different, but good”. Sadly, these franchises have refused to expand north of the border. I even inquired, nine or ten years ago, into getting a Baja Fresh franchise for Alberta. They were looking for development partners who could purchase territories, with a minimum of ten to fifteen million dollars in liquid, unborrowed assets. Needless to say, unless they were willing to accept money from The Game of Life(tm), it wasn’t going to happen. I lamented the fact that I could not get a big, cheap, fresh-mex burrito here, and limited myself to jaunts whenever i headed south of the border. Well, I am pleased to say, we finally have an acceptable alternative here in Alberta. That option is Mucho Burrito. Alberta has seen a few aborted attempts. Taco Time tried their Cantina concept. Chico Tecates brought in a salsa bar, but labour issues pushed them out of business. Taco Del Mar tries to do too much. Even Wrapture came out with a burrito campaign, but they were really masters of nothing. 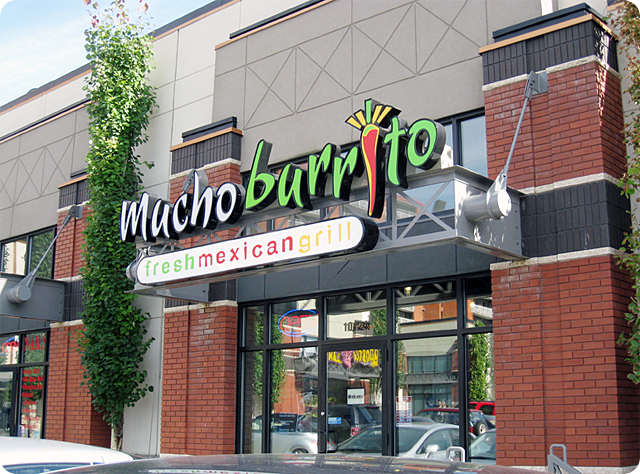 Mucho Burrito is the first dedicated Burrito chain – and they have learned their craft well. Right at the hands of Chipotle in fact. When I first walked into a Mucho Burrito, my first thought was “Chipotle!”. From the decor, to the menu, to the assembly line, the burrito trays, right down to the brown bag they serve the tortilla chips in, everything was eerily similar. To be honest, this actually does not bother me – copy away, as long as you can produce a similar facsimile to the end product. The menu for Mucho Burrito is actually pretty basic – and available online, so i’ll leave some mystery to you all. Let’s concentrate on the burritos. They come in three sizes – 10″, 12″, and 14″. Choice of rice, beans, salsa, cheese, guacamole, roasted veggies and a filling. 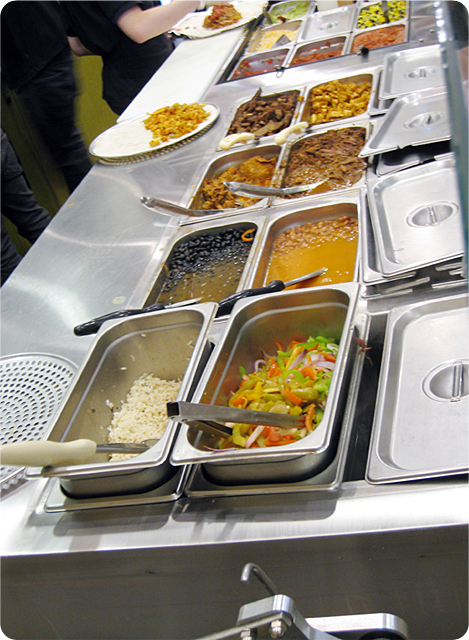 The fillings are basic too – all prepped in the back kitchen, and sitting in chafing dishes to keep warm. Barbacoa, Carnitas, Pollo, and Carne Asada. This is burrito 101. I order the signature Mucho Burrito dish – the Mucho Burrito(14″) – which allows you to top it anyway you like. Looking to test the limits of their generosity, I load the burrito with any topping i can get my hands on. They comply, and promptly create a monstrosity – a meal for two. Tightly wrapped, I can say with some certainty, and glee, the quantity is definitely there. Taking a big bite into it, I am thoroughly satisfied. The Carnitas is decent – good flavour, tender. Nothing i would call great, but for Alberta, it is a minor miracle. Everything is fresh. It’s so busy that everything has to stay fresh – none of it sits around that long. They’ve done an excellent job of balancing all the ingredients, and making sure that the burrito ends up as one goopy, flavour-filled mess. Look, this is not French Laundry or El Bulli. Heck, this is not even Freebird’s. However, when you’ve been starving in the desert for as long as Albertans have, any bit of water is a big sign of hope. Like a good burger, somtimes simple and filling is what the doctor ordered. Is the product perfect? By no means. Would I rather eat real Mexican? Most of the time. But when I am in the mood for something big, sloppy and loaded, a burrito usually hits the spot. 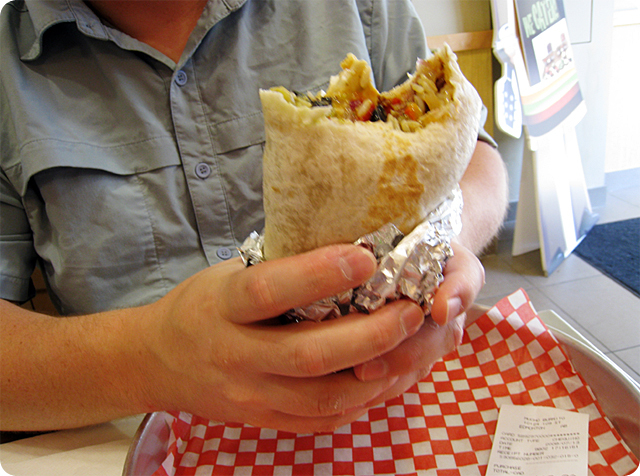 And for the first time in my recollection, there’s a fresh mex burrito worth eating in Alberta at Mucho Burrito. 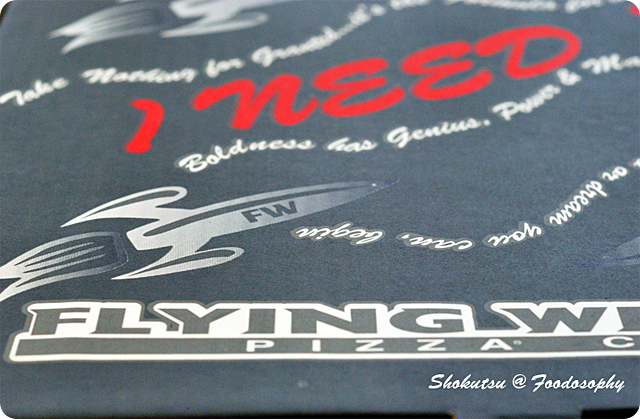 Now with eight locations in Vancouver proper, and seven more in surrounding communities, the Flying Wedge Pizza Co. has probably become very much the “corporate” entity that the founders (three University of British Columbia art students) set out to battle when they opened their first location almost twenty years ago. Now with multiple locations, a franchising business model, and boasting about all the “awards” they’ve won from mainly local media and publications, it seems to me they have lost touch with their claimed spirit of “celebrating the exceptional, and valuing creative and unconventional experiences”. Even the big plastic sign that greeted me as I stepped inside the Kerrisdale outlet shouted out “Pizza Hut” to me: offering up an easy choice of a classic pepperoni or “tropical pig” (call it ham and pinapple will ya!) for $15 for a 12 inch medium size. Nothing too creative or unconventional there I thought. Looking further in the glass case selling pizza by the slice, I did spot a few strange sounding names like “Tuscan Garden” and “Rosso Bossa Nova” on plates beside the same two boring staples from the a fore mentioned sign. As I was standing there checking out the menu, two others came in to pick up their already called-in order. Really hungry and not inclinded to try and decifer each and every strangely labeled option, I eventually settled on the “Wedge Deluxe” (Flying Wedge sweet sauce, mushrooms, green peppers, Italian sausage, onions, dry cured pepperoni, topped with mozarella and cheddar cheese, all on a herb infused dough), which was on their “Extreme Pizzas” sub-menu. I don’t know about that, nothing too wild as far as the ingredients went I thought but trying to get a balance between meat and veg, this was my best bet. Twenty of so minutes later, it was ready to go and off I was (there was a bar seating area with four stools, for those waiting or eating by the slice, but this location is not made to consume a whole pie in a relaxed setting, not sure about the other locations). Opening up the box (incidentally, a predominantly black one, maybe trying to play up their “rebellious” mission) at home, I had mixed initial impressions. Good coverage throughout of toppings and cheese, and a nice thin crust (that I was looking for one this day), but the aroma was not as powerful as I’d hoped. Perhaps it was the herb-infused base, but that seemed to take the lead in terms of scent. The edge crust as well, wasn’t as folded over as thick as I’d hoped, thought thankfully wasn’t burnt. First bite… the visual of well rounded coverage of toppings was confirmed, as I could get a taste of each ingredient immediately. 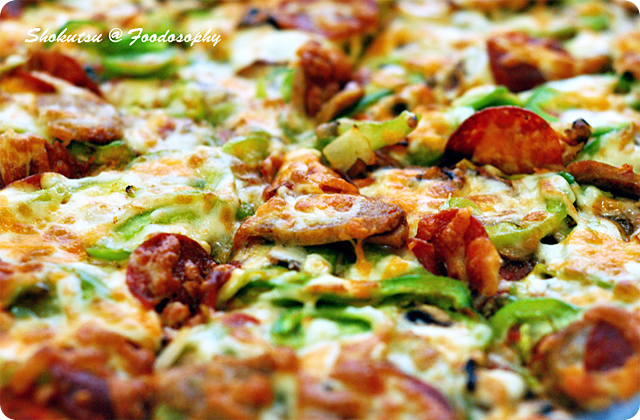 Good crispness of the green pepper, the earthy tones of the mushrooms, the bitterness of the onion, the saltiness of the pepperoni and Italian sausage. 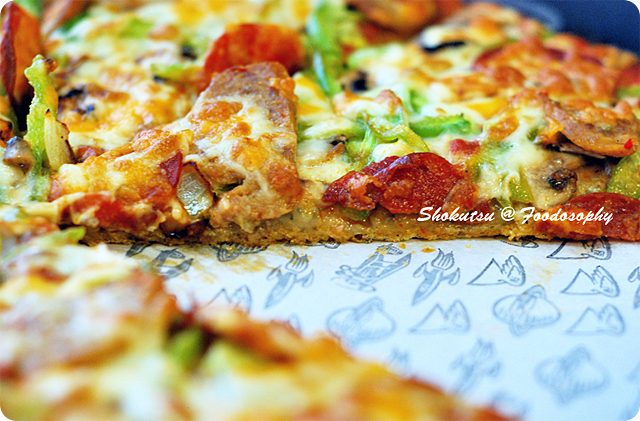 The cheese wasn’t thickly layered and gooey, and thus no extended strings came off the pizza as a piece was separated. I know that means very little except for perhaps the visual, but somehow, I look for that in pizza. Overall, I’d say it was quite average. Nothing mindblowing, spectacular by any means here. One piece and I could have called it a day, but I was hungry so ended up eating three. It lacked that drawing power to want more and more and more. Perhaps it was the toppings? The herb-infused crust that I was having for the first time? Maybe a thicker base was needed on this day for me (I am a big fan of both thick and thin crust pizza). Or maybe it was the in-store feeling I got of this place trying to be cool, but falling rather flat. Perhaps it deserves another chance, with another variation off their menu. Don’t hold your breathe though, as I am sure there are other better pizza joints in town that I have yet to come across. As the Foodosopher said in our very first post, “Cheese, meat, dough. How can you go wrong?”, so you can bet I will be reporting on another pizza offering in the near future. Located in a U-shaped strip mall which is anchored by the popular Korean supermarket chain called H-Mart, the Blue Sea Seafood Restaurant can be found in the far back corner of the parking lot. There’s actually a few Korean restaurants in this compound, along side other shops and businesses catering to the largely Korean community that has taken root in this part of Coquitlam. 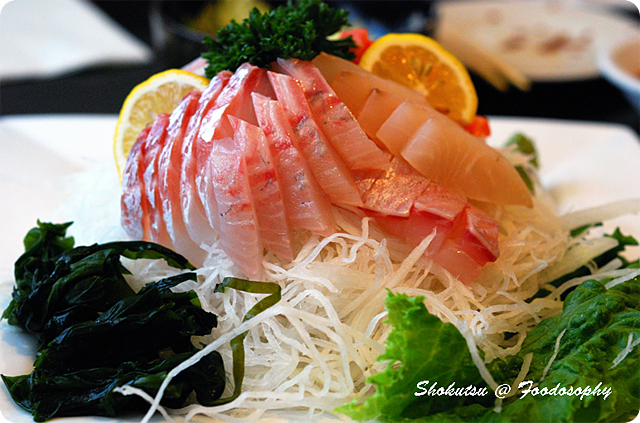 My foodie experience with Korean-style sashimi (which they call Hwe) began about ten years ago with a trip to a city called Sokch’o, located on the Sea of Japan side of South Korea, which is largely a resort and fishing community. There, many casual restaurants were lined up near the waterfront areas, offering up fresh seafood for very reasonable prices. 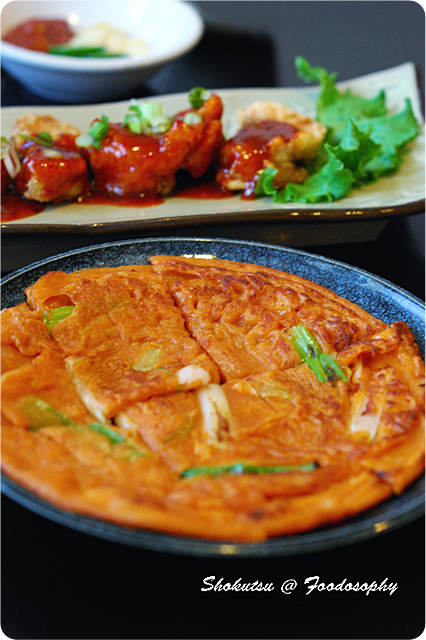 It was there that I first experienced the Korean style of eating raw fish dishes: dipping each slice in a spicy kochujang sauce and taking a leaf and wrapping it up and eating it preferably in one big bite. It was a mighty big change to the Japanese-style of soy sauce and wasabi, but an interesting variation I thought at the time, as I was building my understanding of Korean cuisine. Knowing that seafood generally isn’t cheap, I was prepared mentally to shell out a decent amount of coin on a meal and didn’t mind since I was looking for something a little less common than your usual staples of Korean cuisine such as barbeque, hotpots, vegetarian, etc. Flipping open the menu, the seafood selection was obviously front and centre and I immediately picked up on the $25 per person Hwe offering. It offered five different types of sashimi. My dining partner also went along with this idea, so we ordered two of them figuring we might need to order something else just in case quantity-wise it wasn’t enough, as we were both quite hungry. Would I ever be proven to have underestimated the wonderful power of Blue Sea Seafood Restaurant. My memory of that trip to Sokch’o came bad in a gushing flood, as the first two simple, fresh appetizers arrived at our table a short while after our order was taken. I remembered how Hwe does not just mean the raw fish on a platter, but the array of accompanying dishes that comes with it, making it indeed a full course meal. 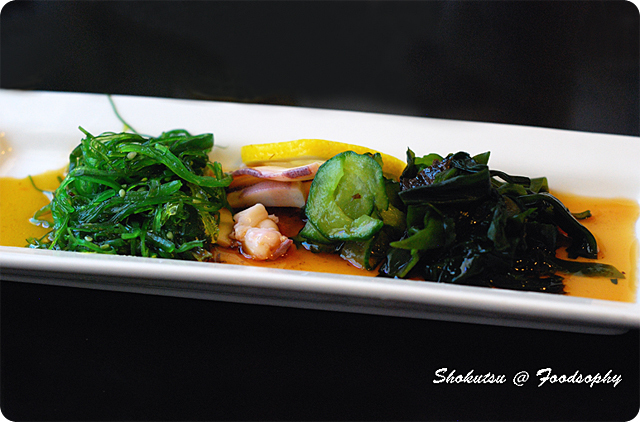 A narrow plate with some small piles of lightly seasoned kelp, marinated cucumber and octopus all covered in a refreshing and light vinegar-based dressing was our first dish. Certainly a pleasant way to get your taste buds activated, and I especially liked the one on the left (the name escapes me at the moment) as it had a stringier, texture that required more effort to chew. Next came some temaki of Julienned cucumber and daikon, topped with some masago, all standing up nicely in an ice cream cone serving device. Once again, very light flavors and nice crispness of the matchsticks of veg inside each cone. I am usually not a huge fan of non-seafood creations like this, but I think in the future I will indulge a bit more after seeing how much I enjoyed these ones. Some hot food dishes followed. A simple green onion chijimi, the size of a mini pizza. I usually like my chijimi loaded with a lot more ingredients, but as this was far from being a main dish, I let it slide, and besides it has a nice chewy texture to it and finally some long awaited heat. Then a plate of some deep fried fish balls, served very much Chinese-style with a sweet, sticky sauce. With it being the first arrival of some actual seafood to our table, I was just getting warmed up. Dish five was a small-ish bowl of a whipped up egg white mixture, flavored with some fish stock of some sort. Very airy and light and easy to scoup up with a spoon. 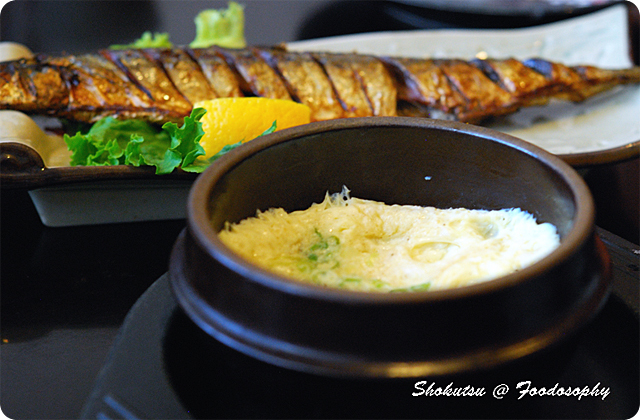 Along with that came a salted, whole grilled mackerel. Unfortunately it came out not-gutted, which I really dislike, as it leaves all those bitter innards. I find mackerel or other smaller fish cooked a lot this way in south east Asia, Mediterranean and Italian dishes, and each time I wished the chef would just take the time to clean out the fish. Plus, this one was overdone on the grill making it a bit too dried out, the first negative dish of the lot to this point in my meal. 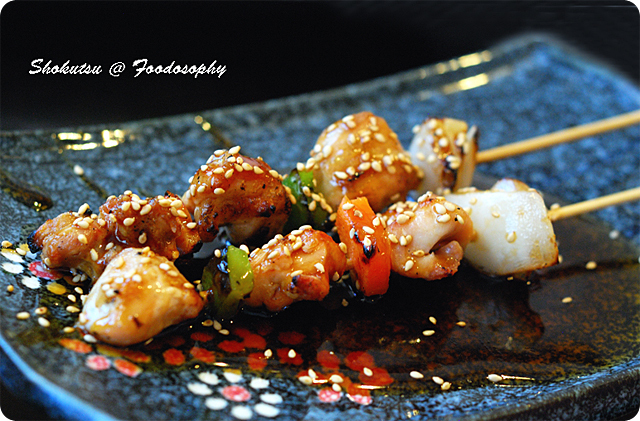 The seventh dish, a take on yakitori, only done with grilled fish and sweeter vegetables. 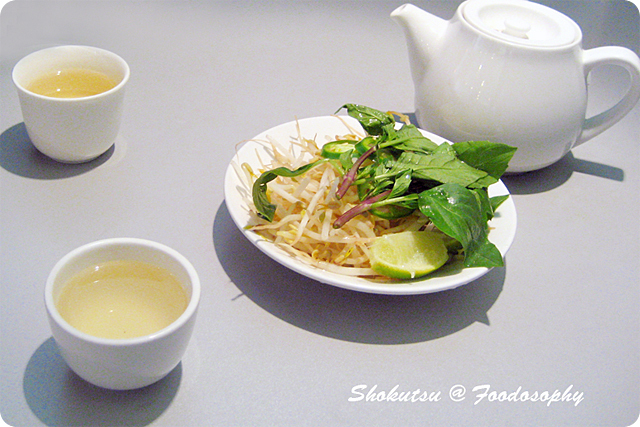 The sauce was similar to the one used in the earlier deep fried fish dish. 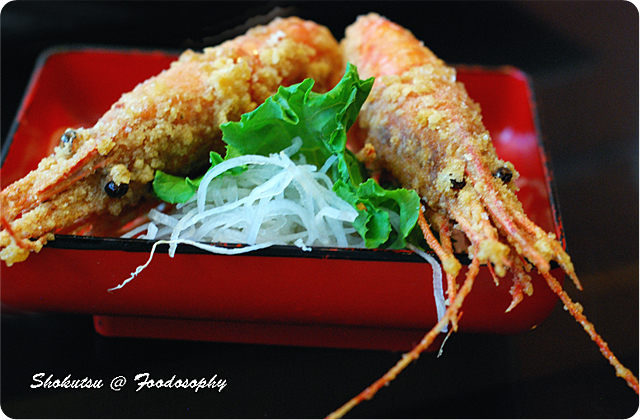 Item number eight was a pair of deep fried prawns, head on. I know a lot of folks might cringe at what I am about to write, but I just eat these things whole, shell and head together. I find the flavors of most crustaceans are in the head, so I am always the first to be chomping, slurping, etc. anything off of or inside the brains of shrimp, crabs, etc. Our server could see how much we were enjoying our meal and brought out a free plate (‘on the house’ she said) of some grilled fish head and neck portions (sorry, I dug right into this before I realized I needed to snap a photo, so no image here), that were probably used to make our fresh fish plate that was forthcoming. I never thought these portions of cooked Red Snapper could taste so good, but it was amazing! I was craving a bowl of rice at that moment, but knew I had to hold back as the best was yet to come. Last (or should I say second last) came the huge plate of Hwe. The picture here does not do it full justice, as there are abundant slices on the sides and also the back side of this plate that are not showing. In total there must have been forty or so nice thick slices of red snapper, tuna, salmon, yellowtail and bonito; all piled upon huge mounds of crisp cool daikon – which I enjoy eating together with the Hwe. Surprisingly though, the expected Korean sides of kochujang sauce and leaves did not appear. I didn’t mind terribly, as I could have eaten it either way, so just went with the soy sauce/wasabi combo on this day. Honestly, the volume of this plate alone of fresh fish was worth the $25 price tag, not to mention all the other dishes that had come before it. 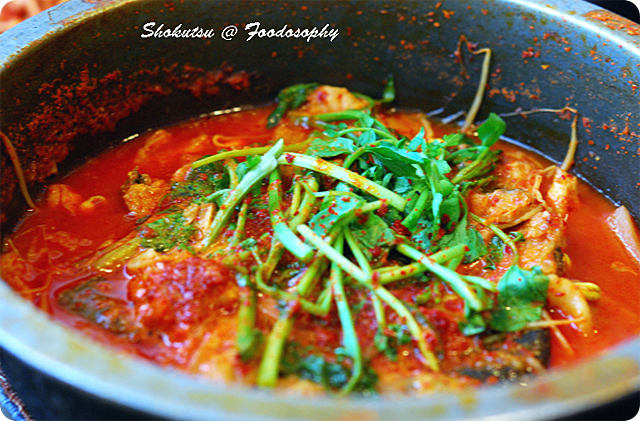 Traditionally, seafood meals are wrapped up with Maeuntang – a large pot of fish stew/soup that that made from all of the leftover pieces of a fish such as the bones, with stock, spicy kochujang paste and lots of vegetables. Pieces of actual fish are also cooked inside as well. Its eaten with steamed white rice, and I’ve had it in some places where the rice is actually added into the pot after the majority of the soup has reduced, making an almost risotto-like dish to wrap up a huge feast. Brunch is one of those love/hate relationships for me. On the one hand, I would generally prefer to eat lunch and dinner foods at any time of day. Give me a nice bowl of Pho, a slice of cold pizza, or a great big burrito instead of bacon, eggs and toast any day. On the other hand, im a real sucker for Eggs Benedict, and hash browns. What this means for me is the occasional foray out for Brunch. And it typically means im ordering the Eggs Benny. 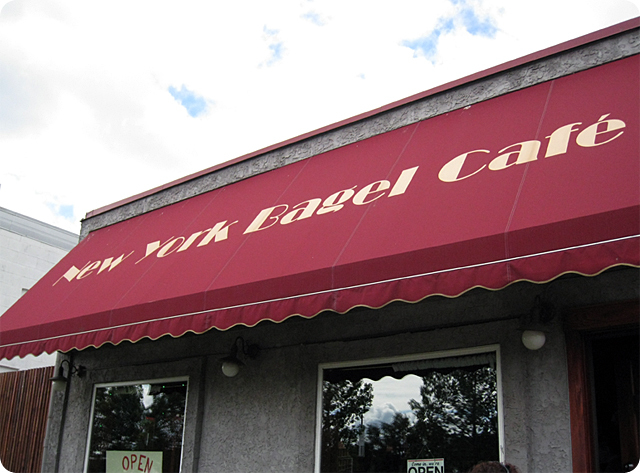 New York Bagel Cafe existed in Edmonton at the corner of Whyte Avenue and Calgary Trail for many years. That was, until a tragic fire took out the Alberts, Pet store, and other establishments it shared a building with. They had a small but loyal following, and yet, were now homeless. Down the street, a few blocks down, was a small mother-daughter sandwich shop that served up organic, sustainable foods, fresh local ingredients in the forms of sandwiches, salads and soups. Twig N Berries was an idea that was too early – before its time. It’s neighbour, the venerable Edmonton institution “Club Malibu”, did not attract the same kinds of crowds they were looking to target. Sadly, they closed their doors as well. This space, once vacated, became the new home to New York Bagel Cafe. The new space was twice as large, and some concern about their ability to reproduce their success from their previous location existed. Maybe the positive vibes that TNB started would be passed onto the NY Bagel Cafe. 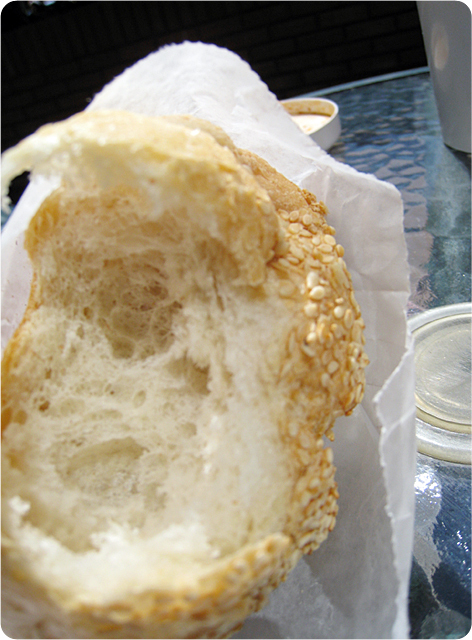 Like a Phoenix fresh from the fire, New York Bagel Cafe came back as good as ever. First off, they have the best eggs benedict in town. Period. Start with a great selection of fixed benedicts – utilizing creative flavour combinations, combined with some seasonal variations. The base for the benedict is your choice of toasted bagel – a more hearty, and solid choice over the traditional english muffin. The eggs are perfectly poached. The hollandaise? Freshly made, stable and no where close to breaking. These large portions are served with the best hash browns, broiled, pan fried, seasoned potatoes that have the perfect combination of toothy and crunch. They are salty, but i like them that way. Lastly, comes an array of exotic fruits. Seasonal berries. Kiwi. Orange. Melon. Dragonfruit. Starfruit. The varieties are endless. And they are always fresh. What else do they have? Omelettes and frittatas. Eggs and Bacon. Platters. 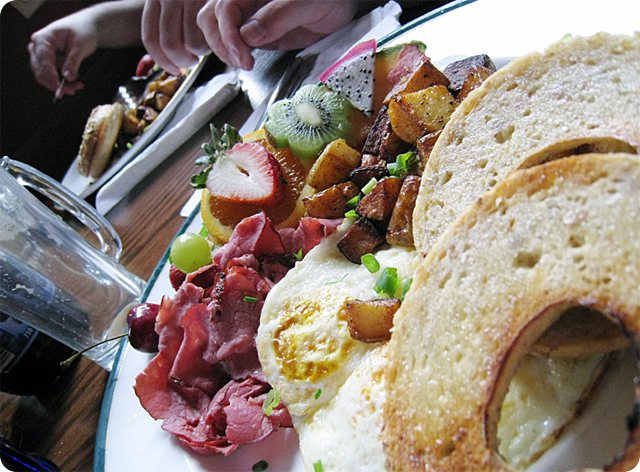 The Montreal Smoked Meat platter is a particular favorite among many patrons. Eggs. Bagel. Smoked meat. Hash Browns. Fruit. Hard to go wrong with that, especially when you wake up two advil short of a lesser hangover. The new location is not without issues however. Food of this quality is made fresh to order. Resulting in painfully long waiting times – typically 60-70 minutes from the moment you order, to the moment you get your food. NY Bagel Cafe is also not much of a secret among the brunch crowd – there can be hour long lineups on weekends, just to get a table. Especially if you show up during the prime hours of 10:30am-1:00pm. They also do not have refillable coffee – making a European latte their “house coffee”. Lastly, they are not cheap. But these days, what is? If these are my biggest concerns regarding a breakfast establishment, I believe we have a winner. At the end of the day, in most cases, I’d still prefer lunch and dinner foods over breakfast foods. 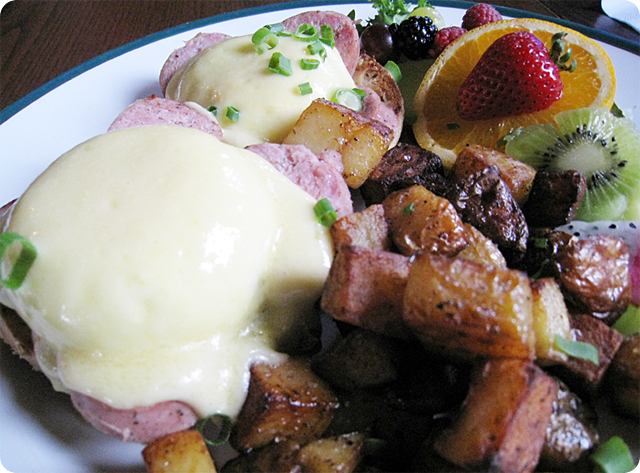 But at any time before dinner, I will take an order of Eggs Benedict from New York Bagel Cafe. They are that good. And for those who know me, that is saying quite a lot. I have to be honest – I have a serious issue with a Calgary food reviewer. Everything I value in a restaurant reviewer is ignored – integrity, humble, discrete, and most importantly, visually anonymous. Instead, developing a cult of personality, and some form of local hero worship seems to be their key MO. They disrespect the food in favour of celebrity. 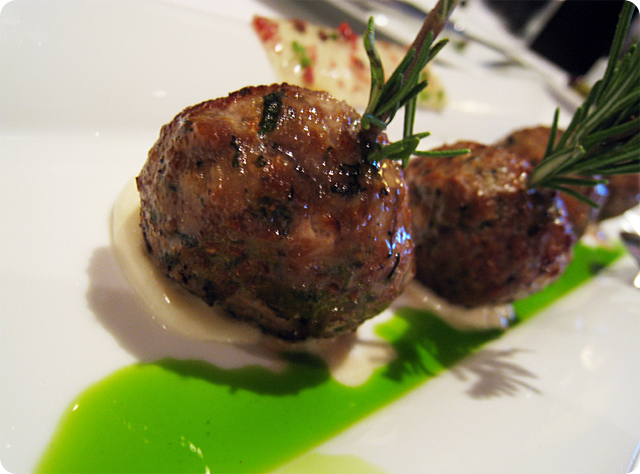 You are never certain if the review is such because the food was divine, or because they were treated that way. There is no bigger crime in my mind. 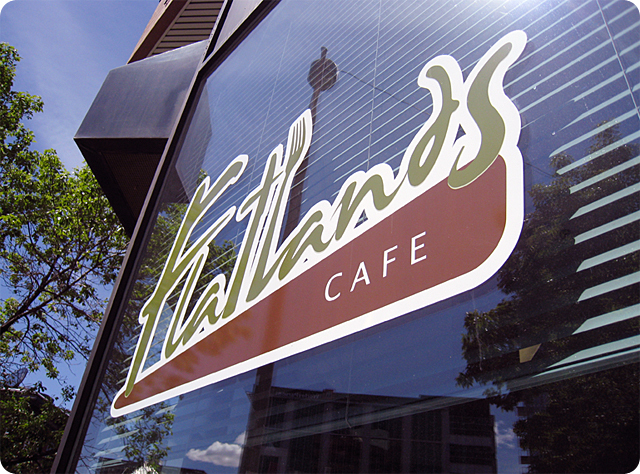 The Flatlands Cafe is one of their highly rated lunch spots, and I’ve tried to avoid it at all costs. After all, the crowds of hero worshippers – what could they possibly know? I was content in my smugness. One day, we found ourselves in the area, and with my favorite restaurant full, we had to find alternative places. This soup and sandwich shop stood a half block away, and beckoned. Flatlands does a few very simple things. Sandwiches. Soups. Salads. Baked goods. They are friendly. They have a lot of regulars. They efficiently deliver their food to the hordes of customers who wait on them, in a crush, every lunch hour. 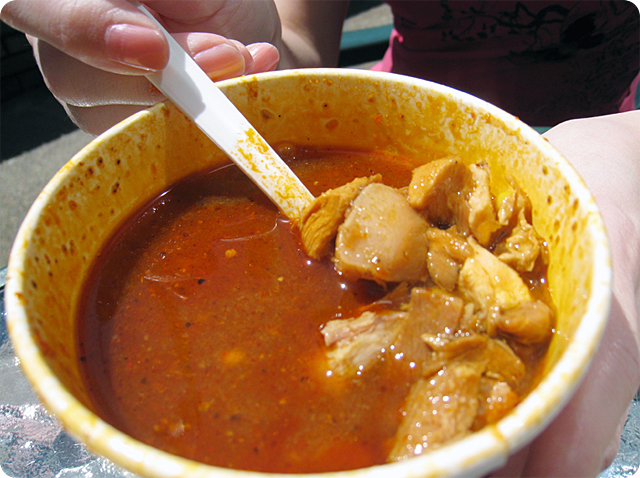 The soup that day was Chicken Chipotle – one of my favorite flavours. Expecting powdered stock, canned chicken, and some adobo sauce dumped in, i was pleasantly surprised to find a flavourful stock, chock full of real chicken, with a great blend of flavours. The bun that accompanied the soup was fresh. 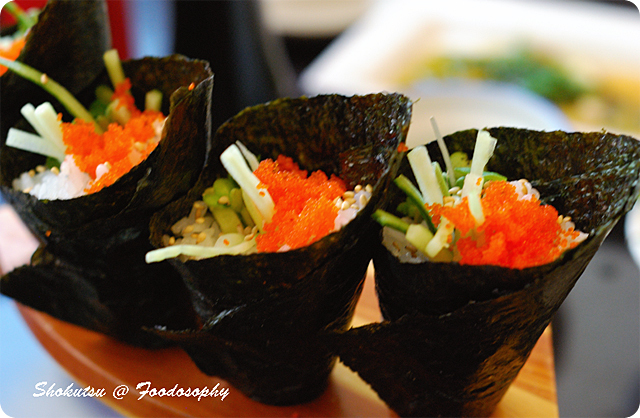 Crispy, sesame exterior, with a soft, tender interior. Great bread. The same applied to their sandwiches. Nothing fancy – just good solid meat, vegetables, and bread. Good selections of each. Didnt try a salad – but im sure they fit the same MO. So I learned something that fateful day, when I stepped out of my box, and joined the throng. I learned that Flatlands Cafe produces good lunch food. And they manage all this with the blessings of the Calgary populist food reviewer. My ideals, my philosophy, my ego – are really all irrelevant. Inspite of who is schlocking it, good food is still good food.